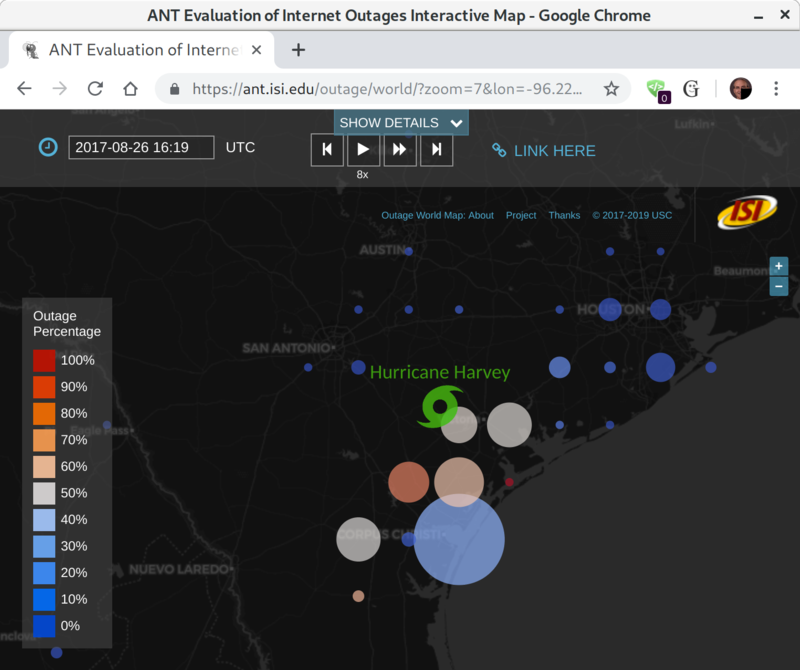 Interactive Internet Outage Visualization to Assess Disaster Recovery (IIOVADR) is a project supporting the use of Internet outage measurements to help understand and recover from natural disasters. Internet outage measurements can be a sensor to measure the effects natural disasters. We have shown that we can observe Internet outages from a few central sites—our work on Trinocular has been peer reviewed and we have been collecting data 24x7 for more than two years. Serious natural disasters often result in Internet outages, typically because of power or communications loss due to utility poll failure, flooding, or wire breakage; this correlation has been shown by several groups. This proposal seeks to make Internet outage data accessible through a new, interactive website}, with the goal of directly assisting citizens, first responders, and scientists to understand the scope of disasters and their recovery. We also propose to use this website and data to compare our outage results with other data sources. Our network outage datasets are publically available. For details about what we provide and how it can be obtained, see our dataset website. IIOVADR is part of ANT Lab at USC/ISI (PI: John Heidemann) and involves collaboration with the FCC Bureau of Public Safety and Homeland Security and Domink Staros. IIOVADR is supported by NSF/CISE as a RAPID grant in response to the 2017 Hurricanes Harvey, Irma, and Maria, award CNS-1806785. A prototype of the website was supported by a grant to ISI from Michael Keston. A key result of this project are updates to our outage website to include near-real-time data with hurricanes overlays. Recent near-real-time results are now the default at the website with continous updates. See also the see the ANT distribution web page. We make all datasets and specifically our network outage datasets public through the LACANIC project.